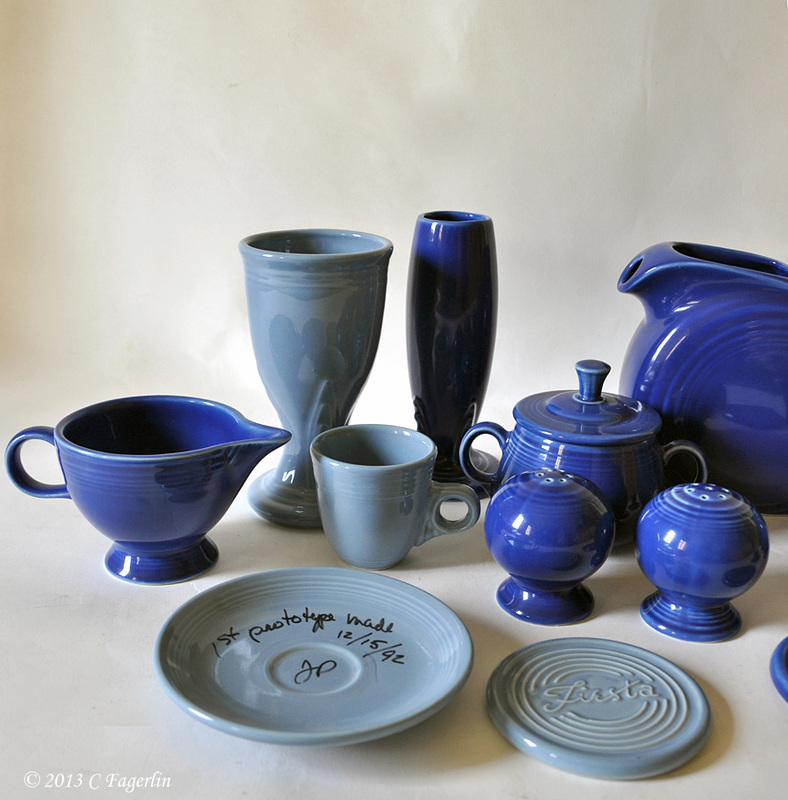 There is something unusual about all of these blues. Can you tell me why each item in this image is "unusual"? Let's start off with whoof these items. 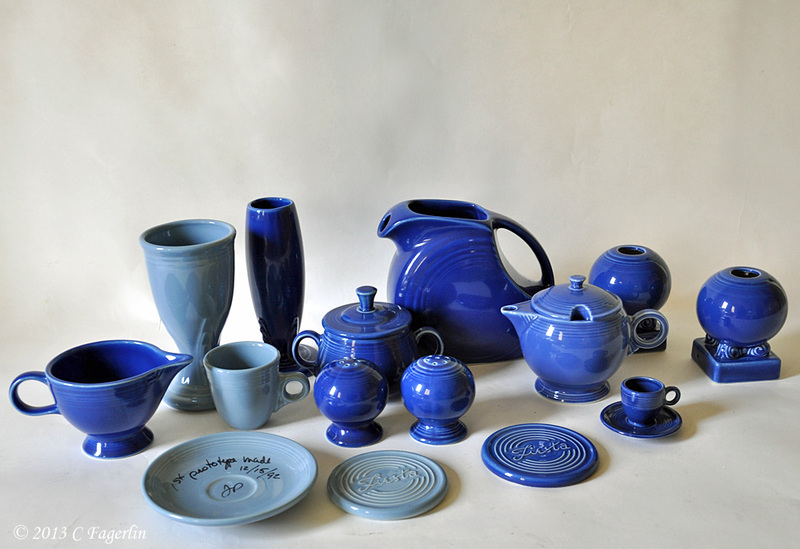 All are genuine products made by the Homer Laughlin China Company, with the exception of the small tea pot and the miniature demitasse cup and saucer. More about those two items later. From left to right on the back row is a prototype of the Post 86 Goblet. Very similar to the Goblet that was eventually released, except it is a full inch shorter at 5 3/4” tall. Look at it in relation to the height of the bud vase. The Goblet stands next to a Post 86 Fiesta Bud Vase glazed in Sapphire. The Bud Vase was not part of the officially produced group of pieces glazed in Sapphire. 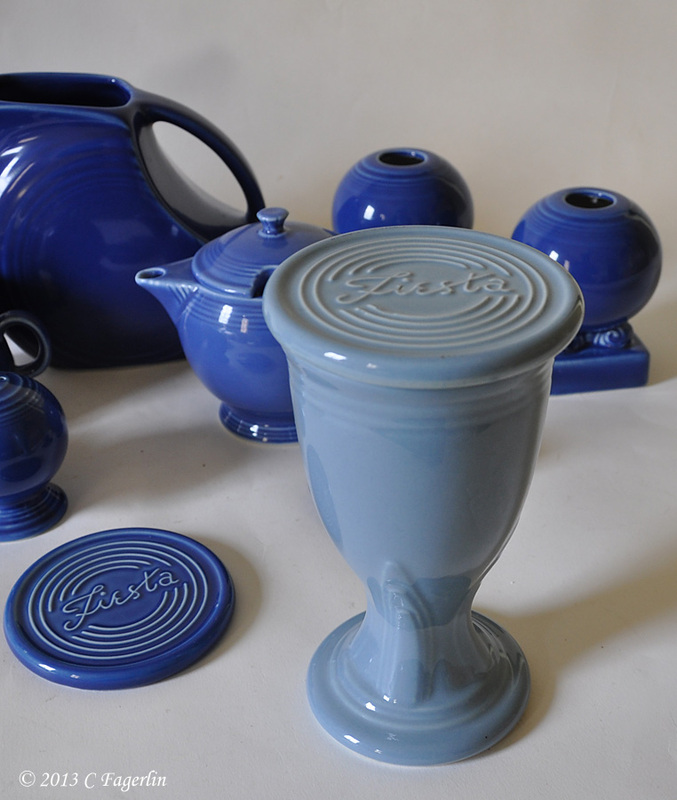 The same can be said about the NOP (not officially produced) Post 86 Fiesta Juice Pitcher (Small Disc Pitcher) and the Bulb Candle Holders glazed in Sapphire. 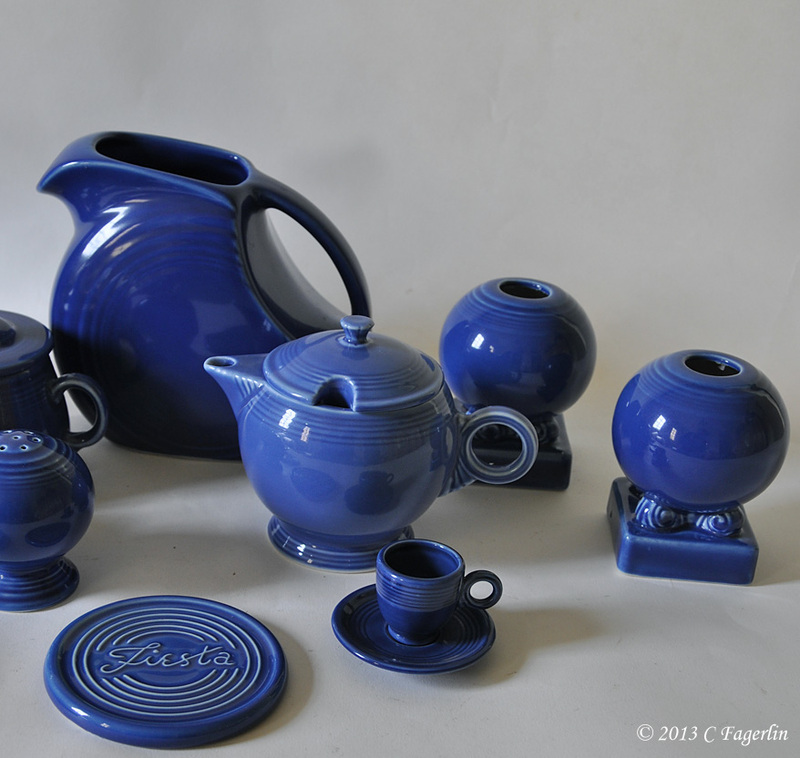 Again from the left the Post 86 Individual Creamer glazed in Sapphire was not part of the officially produced Sapphire group.To the right of the creamer is a Post 86 Periwinkle prototype of the Ring Handled Demitasse Cup and Saucer. The saucer is signed by Jonathan Parry and differs from the final product only in that the handle of the cup is lower than the final product. That leaves just a few items to identify, the Post 86 Covered Sugar Bowl from the Sugar and Cream Tray Set. Aside from the fact that it was NOP in Sapphire, it can easily be distinguished from the vintage version by the finial on the lid. Again the Post 86 Salt and Pepper shakers were NOP in Sapphire. 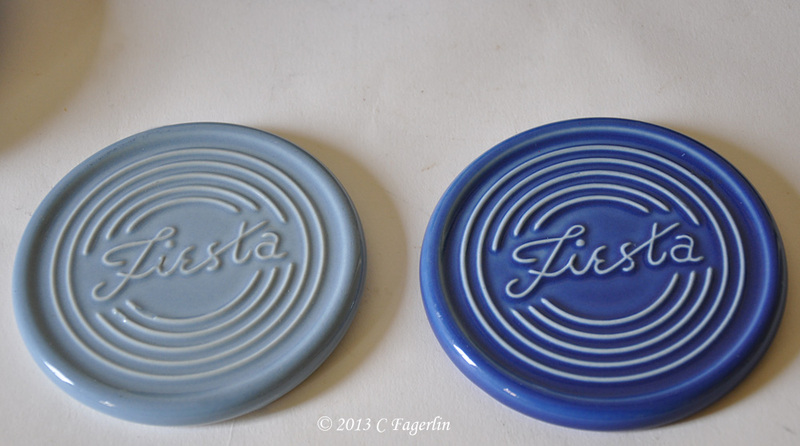 The two small 3 1/2” coasters at the front, one in Periwinkle and one in Sapphire are prototypes for a coaster that was never put into production. They may have been intended to be inserted in some sort of “frame” as some of the trivets were. The back is not finished as you can see in the detail images. And finally we come to the little tea pot and demitasse cup and saucer, shown in two distinctly non-HLC blues. 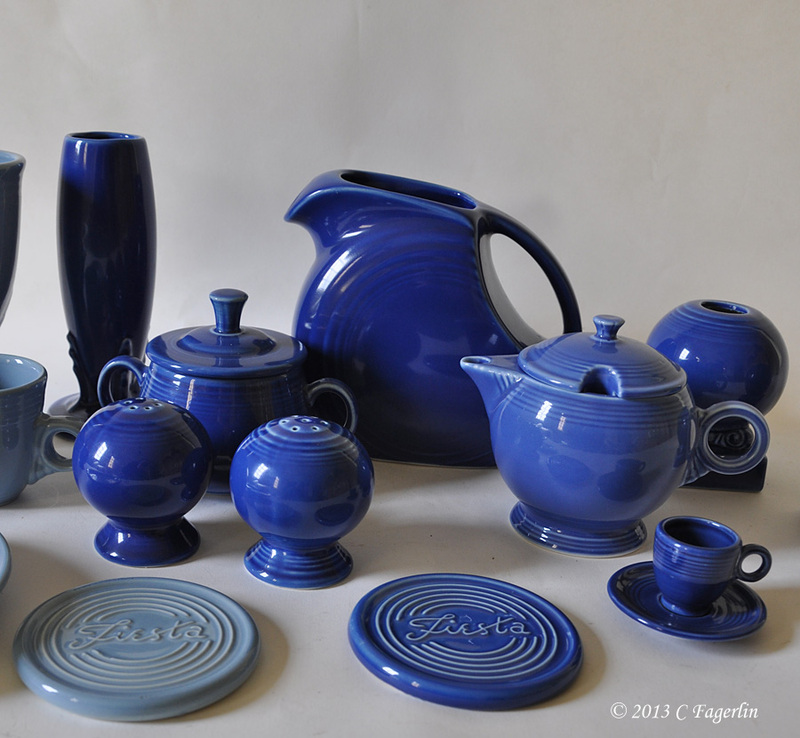 These are the only pieces shown that are not products of the Homer Laughlin China Company. They are prototypes of pieces to be included in a “First Fiesta” tea set produced by Creative Imaginations, Inc. That is the same company that produced the resin miniatures and ornaments, as well as the bulletin board, tacks, stickers and cabinet knobs that were licensed accessories in the late 90s. HLC decided to produce their own My First Fiesta Tea Set in lieu of the CII version. Interesting! I love the colors! You are always a wonderful teacher, Candy! Thanks for the blues lesson today. Thanks ladies, glad you enjoyed the blues! Is there only 1 pair of the sapphire bulbs known to exist?